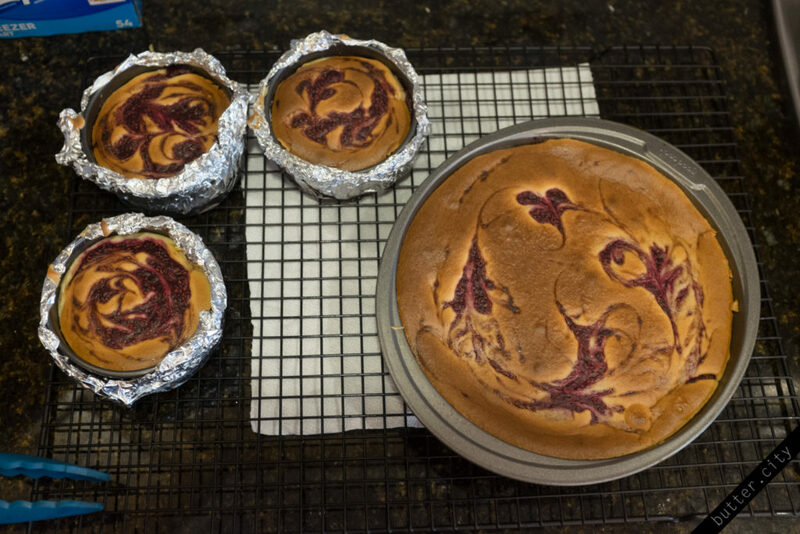 Well, to be more specific: Junior’s White Chocolate & Raspberry Swirl Cheesecake with Junior’s Sponge Cake Crust. This is the longest recipe I’ve logged on Butter.City so far. It’s probably the longest a recipe can be in its entirety before I lose interest and. I guess it didn’t help that I made the full portion of this cheesecake, which is a lot of cheesecake. Volumes were much larger than typical for me. But you know, I did it, with just a teeny tiny snafu (overbaked the cheesecake – but luckily no burnt aroma). If you are up for a challenge, this cheesecake was definitely pretty delicious. It was on the sweet side though, I’d probably take out a third of the sugar next time. Preheat the oven to 350 deg F. Wrap springform pans in aluminum foil, if using. Line pans with parchment paper. 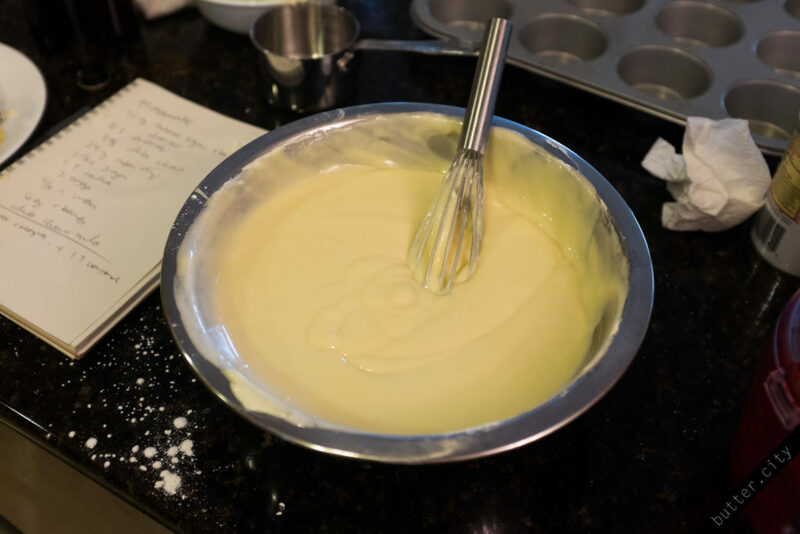 In a small bowl, mix together dry ingredients: 1/3 c less 1 tsp all-purpose flour, loose, 1 tsp cornstarch, loose, 3/4 tsp baking powder and pinch salt.Separate egg yolks and whites of2 large eggs into two large bowls. Set aside egg whites. Using an egg beater, whisk egg yolks until frothy. While whisking, slowly add 2 Tbsp granulated sugar. Beat egg yolks on high until light yellow and flowing in ribbons. Mix in 1 tsp vanilla extract and 2 drops lemon extract. 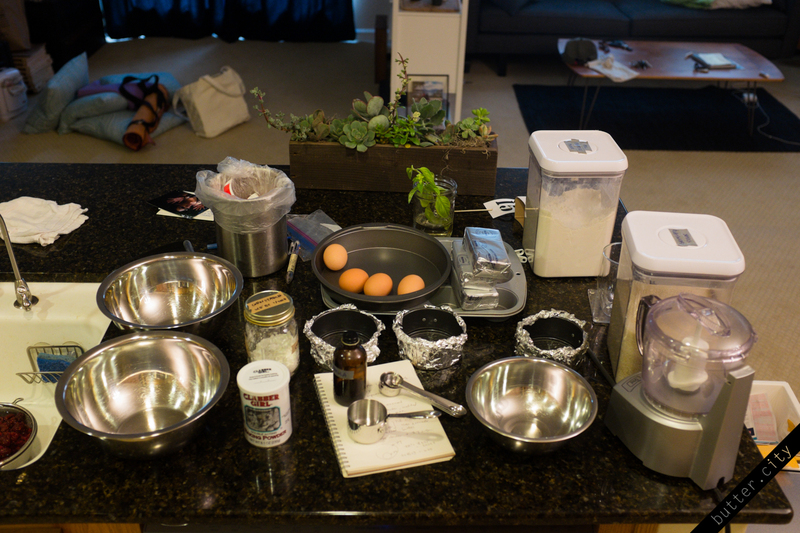 Using a spatula, mix in dry ingredients until just combined. Set aside. Clean egg beater whisks well and dry. Add 1/4 tsp cream of tartar to the egg whites. Using the clean egg beater, beat egg whites until frothy. While whisking, slowly add 3 Tbsp granulated sugar. Whisk egg whites until stiff peaks. Mix a third of the egg whites into the egg yolk mixture, stir until completely combined. Then, fold in remaining egg whites until combined. Pour batter into parchment-lined springform pans or cake pans. 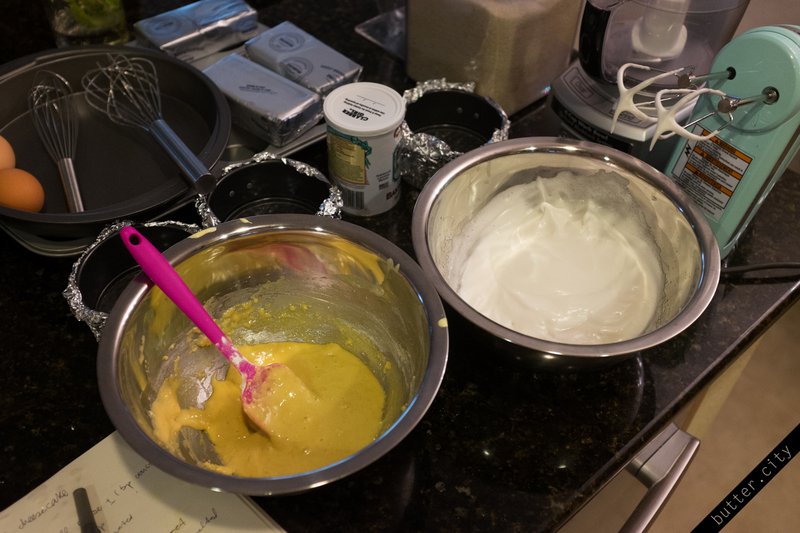 Batter will barely line the base of the cake pans – spread with a spatula to reach all sides. Bake for 10-12 minutes until golden brown on top and cake springs back when pressed lightly. Keeping the oven on, prepare the cheesecake filling. Pulse 10 oz thawed frozen raspberries until pureed. Stir in 1 Tbsp cornstarch and set aside. Melt 8 oz white chocolate in the microwave, stirring every 20-30 seconds, and set aside to let cool slightly. In a large bowl, cream together 8 oz cream cheese, 1/3 c granulated sugar and 4 Tbsp cornstarch. When smooth, add in remaining 16 oz cream cheese, then remaining 1 c granulated sugar, then 1 tsp vanilla extract. When fully mixed, beat in 2 large eggs, at room temperature, one at a time. Mix in the melted white chocolate, then 2/3 c heavy cream, until just combined. Spoon a thin layer (half the filling) of cheesecake over the cake crust. 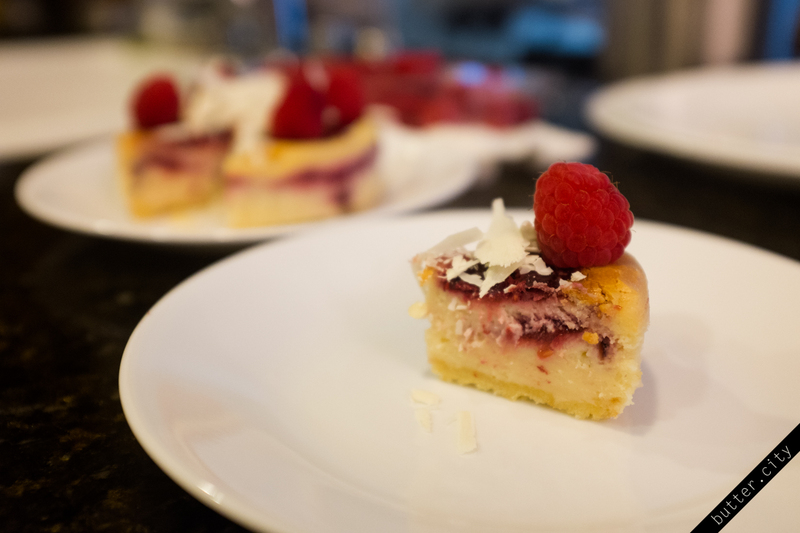 Drop raspberry puree onto cheesecake mixture, then repeat the layer of filling and raspberry. Use a thin knife or long toothpick to swirl the puree into the cake. Don’t overmix, to keep the colors from mixing. Let pans of cheescake cool on a wire rack for a full 2 hours before refrigerating for 4+ hours. 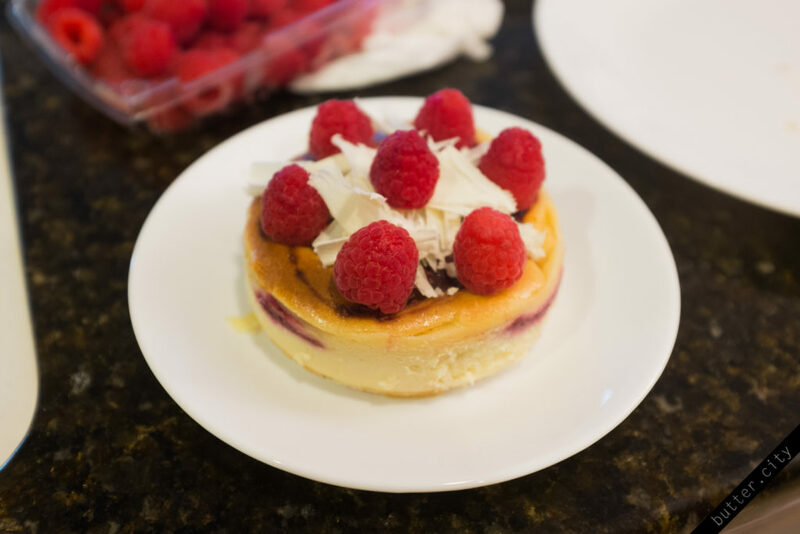 When cheesecake is fully cooled, before serving, decorate with shavings made from remaining 4 oz white chocolate and 6 oz fresh raspberries. 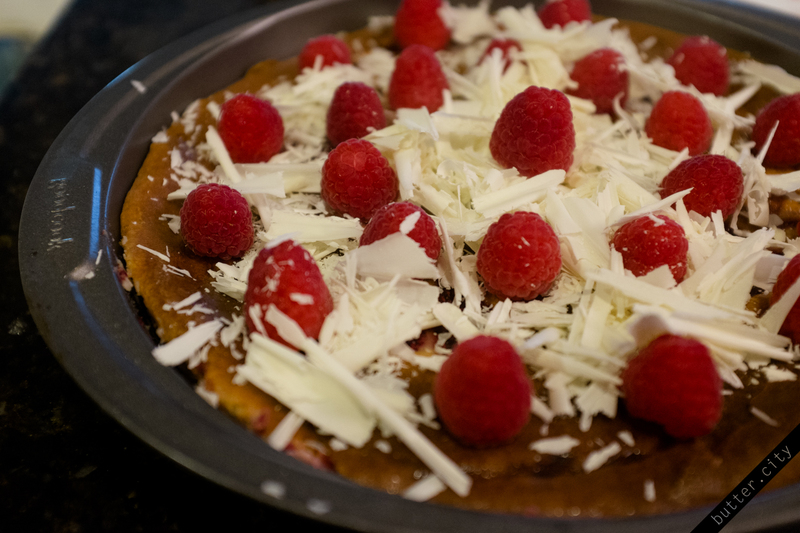 Cheesecake freezes well (without fresh raspberries) and can defrost in 1 day in the refrigerator. there is still 1 in the freezer!